What is honey and how does it benefit our health? There are many raw honey benefits that have a long history in healing by promoting energy. Honey has natural antibiotic properties and is known to be very effective for wound healing. Honey is basically simple carbohydrate, rather like sugar. However some of the nutrients contained in honey, although in small amounts, make it slightly healthier for us than sugar. Sugar contains no nutrients at all. What Are The Main Raw Honey Benefits? Honey has been used as a cough and cold remedy for many years, when mixed with lemon and hot water. digestive complaints such as stomach ulcers. Its anti inflammatory action can help with reducing pain and increasing circulation, which can speed up most healing processes. Honey has also been used as a dressing for wounds as it contains some powerful antibacterial properties that can help clear infections. Bees produce honey by mixing nectar, the sweet substance secreted by flowers, with bee enzymes. Honey is made up of mainly simple carbohydrate and the small amount of protein in it contains half of all the amino acids. Honey varies slightly in its nutrients and this is noticed in how dark or light it is. This variation depends largely on where it is produced. It is well known that locally produced honey can be a remedy for hay fever. Honey is also used for sweetening other foods and beverages. It varies in color and taste depending on the origin of the flower and nectar and the lighter the honey the greater the fructose content. In general it is twice as sweet as sugar, therefore not much is needed for sweetening purposes. People who have diabetes should be careful when consuming honey as it effects blood sugar levels in the same way that refined sugar does. Unheated, unprocessed raw honey should never be given to an infant under one year of age. 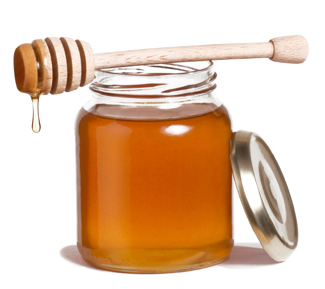 In its natural form, honey can contain spores of the bacteria that cause botulism. This poses no problem for adults and older children, but in infants, the spores can lay in the digestive tract and produce the deadly botulin there. Honey is safe for babies after 12 months.